News TV Channel / 24 News is a television channel from Skopje, Macedonia. Television specializes in news broadcasts that are broadcast every hour. Television is available in the big world channels where 24 hours of news are broadcast, and part of the program is from the format of the documentary program devoted to the process. 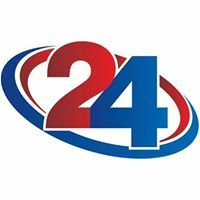 TV 24 news in Macedonia is available through cable operators and other platforms, as well as satellite ( Eutelsat 16 ).